Oliver Tills (with Professor John Spicer and Dr Simon Rundle) is researching the variation in the timing of embryonic developmental events within species. Evolution occurs through changes in the way organisms develop and therefore understanding how these changes occur is critical to understanding development, ecology and evolution. Changes in the timing of development between species (heterochrony) has been widely documented and has been proposed by some scientists as the main mechanism of evolution. Using aquatic embryos they are investigating variation in the timing of a suite of key physiological, behavioural and morphological developmental events. Their research has revealed that within a population of Radix balthica (freshwater snail), embryos which are more closely related (genetically) have more similar developmental event timing, suggesting that this within species variation has a genetic basis. 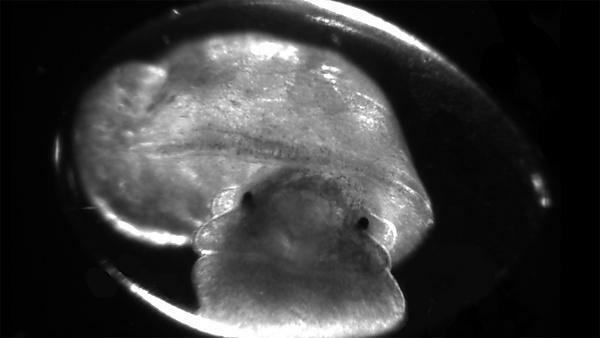 To facilitate their research they have developed a unique automated, high resolution imaging system (see below) which allows them to video the entire embryonic development of up to 384 aquatic embryos simultaneously. This system produces high resolution video of an embryo's development and allows them to pinpoint the precise timing of developmental events. These imaging systems are facilitating them in addressing questions relating to the place of variation in developmental timing in evolution and are allowing the generation of high quality video of a diverse range of aquatic embryos.